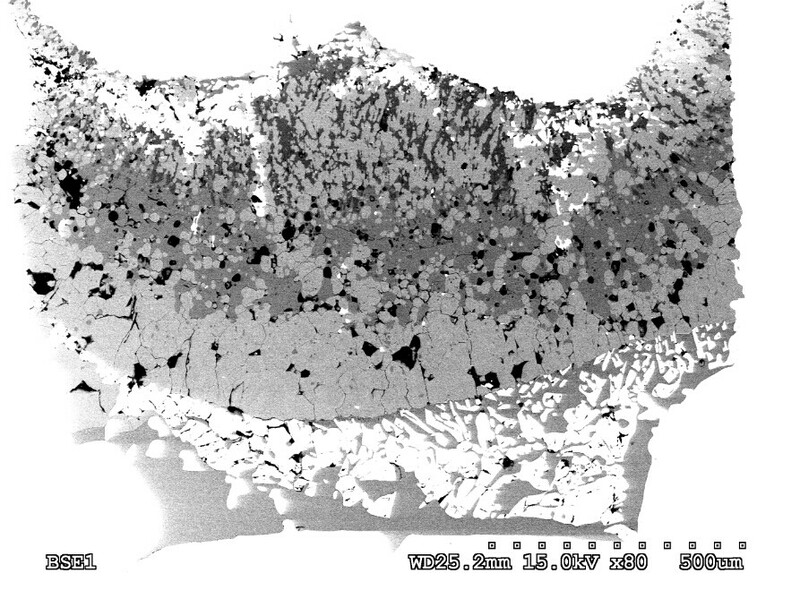 Back-scattered electron image of a sample produced in the multi-anvil press at RSES at 13 GPa and 1250°C. The lower part is quenched alkali-rich carbonatite melt (the bright phase is a mixture of ReO2 and Re metal, which maintains the oxygen state at high levels to prevent reduction of the carbonate to diamond). The upper 2/3 of the sample is majoritic garnet (bright phase), omphacitic clinopyroxene (mid-grey) and stishovite (dark grey). The black patches are holes in the polished sample surface. The image was obtained using a Hitachi FE-SEM in the Centre for Advanced Microscopy at ANU. The carbon cycle between various reservoirs in the Earths’ exosphere (atmosphere-hydrosphere-biosphere) exerts a critical control on climate on a range of time scales which are short relative to the age of the earth. However, the earth has a much deep carbon cycle, whereby carbon is recycled from exosphere into the deep mantle via subduction and returned to the exosphere during volcanism, on much longer time scales of millions or billions of years. My colleagues, students and I are investigating this deep carbon cycle using a range of techniques, including high pressure experimental petrology using multi-anvil and piston-cylinder apparatuses, with sophisticated microbeam imaging and analysis of experimental run products. We are interested in the stability and melting temperatures of carbonate phases during deep subduction at pressures relevant to the sub-arc environment (≤ 6GPa), down to the uppermost part of the lower mantle (≤23 GPa). As an example, the back-scattered electron image shows a multi-anvil experiment conducted at 13 GPa and 1250°C on an average mid-ocean ridge basaltic composition with a few wt% CaCO3 added. This is simulating deep subduction of altered, mafic oceanic crust, which commonly contains a small amount of calcite, added during hydrothermal alteration of the crust. Under these conditions, the sample has crystallized an assemblage of majoritic garnet + omphacitic clinopyroxene + stishovite, with a carbonatitic partial melt. This indicates that along relatively warm subduction geotherms, deeply subducted carbonate-bearing oceanic crust could produce carbonatitic melts in the deep upper mantle. The effects of these when they segregate from the subducting crust and move into overlying peridotite are currently being experimentally investigated. Of great importance is the influence of oxygen fugacity on carbon’s behaviour under these P-T conditions. We have developed and applied a synchrotron-based method (Fe K-edge XANES) for determination of the Fe3+ content of mantle garnets in kimberlite-bourne peridotites (Berry et al. 2010; Yaxley et al. 2012; Hanger et al. 2014) and eclogites. This enables determination of the mantle oxygen fugacity in the cratonic lithosphere and deeply subducting oceanic crust, and investigation of its effects on diamond stability, partial melting and metasomatism. Yaxley, G.M., Kamenetsky, V., Nichols, G.T., Maas, R.E., Belousova, E., Rosenthal, A., & Norman, M. (2013). Discovery of kimberlites in Antarctica extends vast Gondwanan Cretaceous province. Nature Communications, DOI: 10.1038/ncomms3921. Kiseeva, E.S., Yaxley, G.M., Stepanov, A.S., Tkalčić, H., Litasov, K.D. and Kamenetsky, V.S. (2013). Metapyroxenite in the mantle transition zone revealed from majorite inclusions in diamonds. Geology 41, pp. 883-886. Berry, A.J., Yaxley, G.M., Hanger, B.J., Woodland, A.B., de Jonge, M.D., Howard, D.L., Paterson, D. and Kamenetsky, V.S. (2013). Quantitative mapping of the oxidation state of iron in mantle garnet. Geology 41, pp. 683-686. Kiseeva ES, Litasov K, Yaxley GM, Ohtani E and Kamenetsky VS (2013) Melting and phase relations of carbonated eclogite at 9-21 GPa and the petrogenesis of alkali-rich melts in the deep mantle Journal of Petrology 54, 1555-1583. Litasov KD, Shatskiy A, Ohtani E, Yaxley GM (2012) Solidus of alkaline carbonatite in the deep mantle Geology 41, 79-82. Yaxley GM, Berry AJ, Kamenetsky VS, Woodland AB & Golovin AV (2012) An oxygen fugacity profile through the Siberian Craton - Fe K-edge XANES determinations of Fe3+/∑Fe in garnets in peridotite xenoliths from the Udachnaya East kimberlite Lithos 140-141, 142-151. Kiseeva ES, Yaxley GM, Hermann J, Litasov KD, Rosenthal A, Kamenetsky VS (2012) An experimental study of carbonated eclogite at 3.5-5.5 GPa-implications for silicate and carbonate metasomatism in the cratonic mantle Journal of Petrology 53, 727-759. Spandler C, Yaxley GM, Green DH & Scott D (2010) Experimental phase and melting relations of metapelite in the upper mantle: Implications for the petrogenesis of intraplate magmas Contributions to Mineralogy and Petrology 160, 569-589. Rapp RP, Norman MD, Laporte D, Yaxley GM, Martin H & Foley SF (2010) Continent formation in the Archean and chemical evolution of the cratonic lithosphere: Melt-rock reaction experiments at 3-4 GPa and petrogenesis of Archean Mg-diorites (Sanukitoids) Journal of Petrology 51, 1237-1266. Berry AJ, Yaxley GM, Woodland AB & Foran GJ (2010) A XANES calibration for determining the oxidation state of iron in mantle garnet Chemical Geology 278, 31-37.